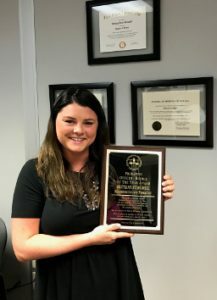 The “Rookie” Probation Officer of the Year Award was established to recognize probation officers who, while at the beginning of their career, show the attitude, aptitude, and the desire to improve themselves and to develop into leaders among their peers. Nominees shall be within their first two (2) years of certification as a probation officer in the state of Indiana. Past winners of this award are Melanie Strode and Rachael Jones. The 2017 winner is an adult probation officer that began her career in 2016. In the nomination for this honor, her Chief Probation Officer Susan Bentley notes that this individual is timely, dependable, and has a positive attitude. The 2017 Rookie Probation Officer of the Year is Brittany Stodghill of the Hendricks County Probation Department. On behalf of the POPAI Board, please join me in congratulating Brittany Stodghill as this year’s Rookie Probation Officer of the Year. There were no qualified candidates submitted in 2016 or 2018.